For 2011, Hyundai completely redesigned the Sonata, adding both value – with their base model four-cylinder-powered GLS – and power – with their 2.0T turbocharged model. Now Hyundai is releasing the next new mode in their model lineup: ecology, with the all-new Sonata Hybrid, Hyundai’s first ever hybrid model. To better compete in the marketplace, the Sontata’s eco model and its all-new hybrid powertrain is enhanced by an exterior and interior that look as if they’ve been plucked from a vehicle twice the price. To us, this is a hybrid that exudes a sense of class missing from the mid-size sedan playing field. The slightly redesigned exterior and interior exclusive to the hybrid model adds a sense of differentiation from other Sonatas in the lineup. Vastly improved fuel economy and a more luxurious look and feel in an ‘eco’ package is a big win. The Sonata comes with a number of standard features not seen on a most of the competition. The 10-year/100,000-mile warranty is the best in the business. 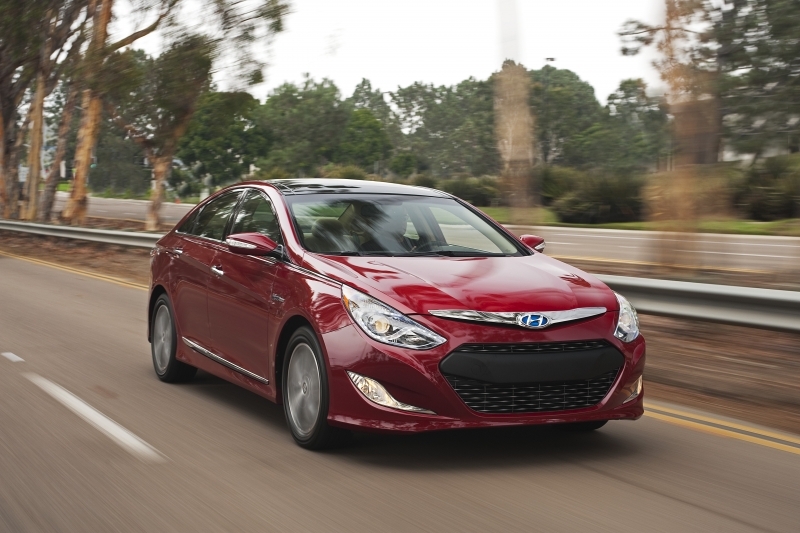 The Hybrid’s future tech look and feel may alienate some of Hyundai’s core buyers. 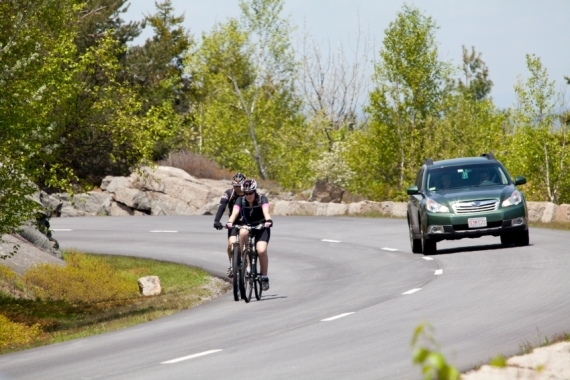 The Hybrid is a lot louder than the turbo or base model – eco friendly, low rolling resistance tires will do that. 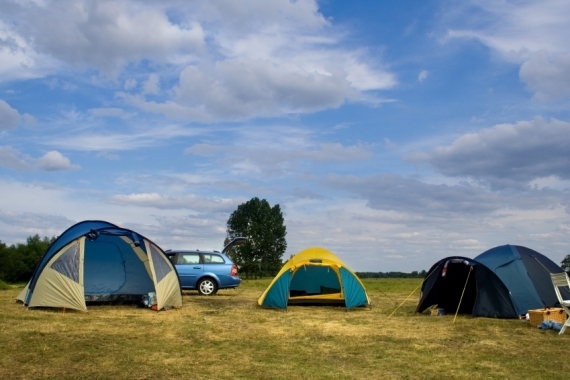 Gas mileage is good, not great, when compared to the Insight or Prius. Hybrids are a lesson in enjoying the drive, no matter what the speed. With a hybrid, you just press on the gas, watch your speed and aim to attain the best mileage you can; the Sonata Hybrid doesn’t do much to quash the common belief that hybrids aren’t sporty. The car’s all-new hybrid powertrain does the best job it can to push the Hybrid down the highway, through mountains and across the city, all in an eco fashion - just don’t expect too much of spirited driving experience compared to the all-new turbo model. The ride is neutral, without much of the fussiness of the most other hybrids, and for that we thank a real six-speed transmission, as opposed to a CVT. The Sonata Hybrid, according to Hyundai, can drive on its all-electric power at speeds of up to 62 mph, which is a neat feature, and very different than what the competition offers. If you manage to temper your inner leadfoot, you’ll find both drivability and mpgs will be rewarding. This hybrid actually feels like a real car. For this model, Hyundai debuts their first ever hybrid engine. Hyundai’s powerplant of choice is their Theta II 2.4-liter four-cylinder engine recalibrated to run on an Atkinson Cycle. The 169 horsepower engine is combined with a 40-horsepower electric motor. Hyundai says the tag-team is good for a combined 206 horsepower and 193 lb-ft of torque. This is mated to a six-speed automatic transmission, which we feel has a better drivability than hybrids that feature a CVT transmission. 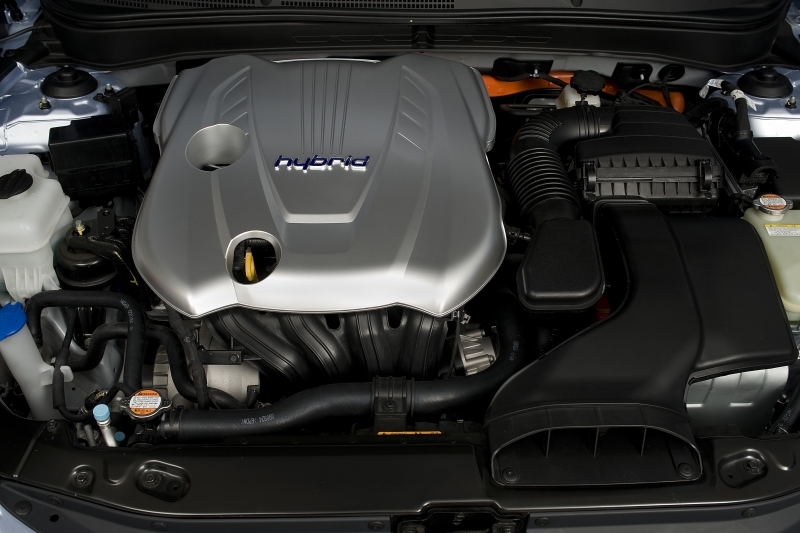 The powerplant is a marvel of technology for Hyundai and a home run the first time out. Like the rest of the lineup, the Sonata is equipped with a huge amount of standard features including push-button start, power locks and windows, iPod/USB integration, an auxiliary jack, Bluetooth connectivity and XM satellite radio. The most interesting features though are the engine and the all-new battery pack. While we love the hybrid engine and all-electric drive, the real marvel is the Sonata’s next-generation battery pack – an industry first lithium-polymer battery, which blows away the standard nickel-metal and lithium-ion batteries of today. These new types of batteries provide more robust performance and durability and are considerably lighter than the others. Hyundai calls its full spate of new technologies its Blue Drive – which incorporates all of the hybrid driving systems and functions, like start/stop, electric driving and the in-car management features. Like other manufactures, the Sonata lets the driver manage their eco driving by turning the act of driving into an eco game. Fuel economy numbers are good, not great, compared to a Toyota Prius or Honda Insight, but they are on par with the Ford Fusion and Toyota Camry Hybrid. The Sonata Hybrid ekes out 37 miles per gallon in the city and a 39 mpg on the highway, mileage that will definitely reduce the number of times you have to visit the pump. 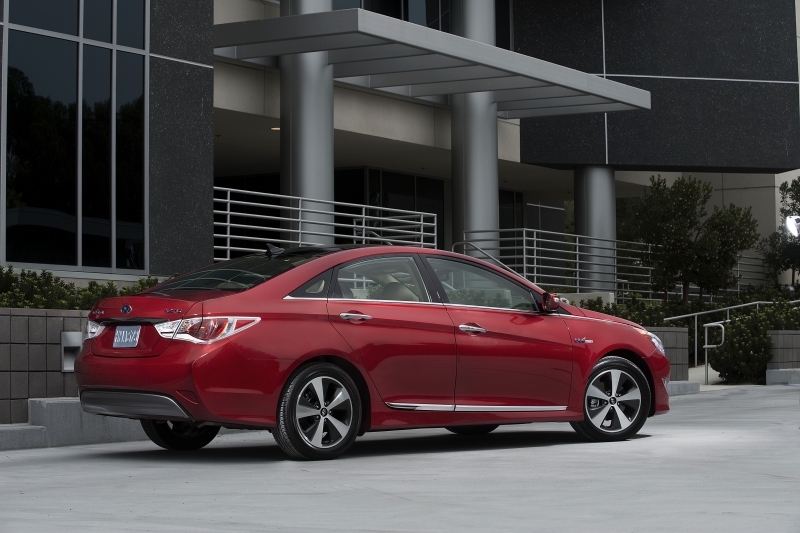 The one major difference between the base Sonata and the Hybrid is the center stack cluster. The LCD screen displays information like the fuel economy and your ‘Eco Score,’ as well as the state of the battery charge. 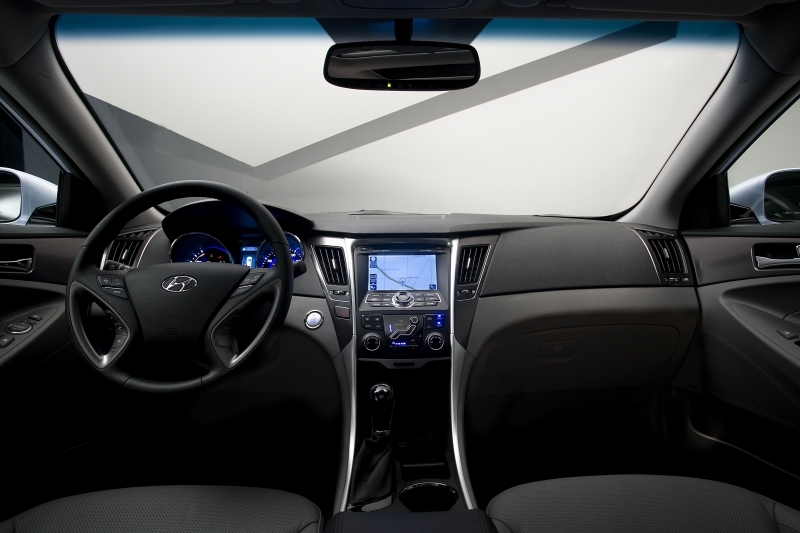 Aside from the hybrid-only aspects, Hyundai has made a habit of improving their interiors with each generation. Simply said, the driver’s seat is a beautiful place to be. The modern, high-quality dashboard rises out of the center console and is laden with soft-touch plastics and chrome accents. While the seats could be a little more supportive and some of the buttons are tough to read at a glance, overall we are impressed with the level of refinement found in the car. To differentiate the hybrid from the standard and turbo models, a few features to the exterior have been changed, including different front and rear fascias, reworked taillights, different wheel options and a slew of Hyundai Blue Drive badges. The hybrid model feels more luxe than the rest of the lineup. As with all the Sonatas, what was a once bland and unexciting looking car has for 2011 been vastly improved with hints of Volkswagen CC, Mazda 6 and Lexus ES. The sweeping, coupe-like styling gives the Sonata an upscale road presence that is echoed throughout. Pricing for the Hyundai Sonata hasn’t been released, but we expect it be somewhat reasonable, after all, it is a Hyundai. The 2011 Sonata Hybrid competes with the likes of the $19,800 Honda Insight LX, the $22,800 Toyota Prius II and the $27,950 Ford Fusion Hybrid. We really like the new Sonata Hybrid and, for a first-generation model from Hyundai, it’s a home run. We like to think of the Hybrid as a more eco-conscious mini-version of its big brother, Genesis. You can really see and feel the billion-plus dollars in R&D Hyundai put into the Sonata – especially with all the techno doodads in the Hybrid. The Sonata Hybrid is a great cross-shop for those looking for a mid-sized Japanese sedan in hybrid form that won’t break the bank.